Like what I did there with the title? The NHL’s stance on goaltender interference needs a review. Speaking of which how many of you saw the game between the Oilers and Flames yesterday, where in Overtime, the Oilers had a goal disallowed due to what was deemed goaltender interference by the NHL Command Centre in Toronto? Unbelievable. Yet again the Edmonton Oilers were stiffed by the League. This time it was so bad that the face of the NHL, Connor McDavid, had seen enough and chirped the refs after scoring in the Shoot-Out to give the Oilers the win. After scoring the Shootout winner, McDavid pointed upstairs as if to tell the league “Review this.” This article form the Edmonton Sun sums it up nicely. “This is the same league that let Ryan Kesler grab Cam Talbot’s pad and pull open his five-hole in last year’s playoffs, remember. Case in point look at this comparison and tell us which goal should have been allowed and which one should have been disallowed. Let’s be realistic about this. Those missed calls in the Anaheim Ducks / Edmonton Oilers playoff series cost the Oilers a couple of games and the Series. I’d venture that even some Anaheim players would agree with that statement. Who know those missed calls may have in fact cost the Oilers a Stanley Cup. Who’s to say they wouldn’t have gone on to beat Nashville in the Conference finals and then a battered Penguins team in the Stanley Cup finals? Missed calls don’t have a larger impact than that. I watched the OT and disallowed goal with my eight year old son. We were in disbelief. Even he stated that the Oilers were not being treated fairly. He asked why doesn’t the NHL do something about this? Good question… from an 8 year old no less. Players and coaches are frustrated. Players roll their eyes, goaltenders who in fact are being interfered with (Cam Talbot) and not getting the call are frustrated. Marquee players such as Connor McDavid, who is a respectful as they get, has become frustrated as well. 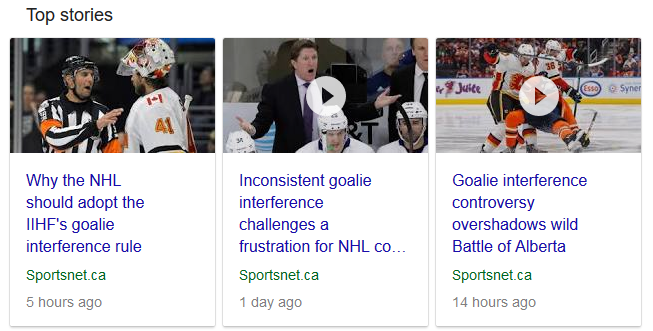 No one know what goalie interference is anymore. Right Milan Lucic? What is goaltender interference anyway? Interference on the Goalkeeper – This rule is based on the premise that an attacking player’s position, whether inside or outside the crease, should not, by itself, determine whether a goal should be allowed or disallowed. In other words, goals scored while attacking players are standing in the crease may, in appropriate circumstances be allowed. Goals should be disallowed only if: (1) an attacking player, either by his positioning or by contact, impairs the goalkeeper’s ability to move freely within his crease or defend his goal; or (2) an attacking player initiates intentional or deliberate contact with a goalkeeper, inside or outside of his goal crease. Incidental contact with a goalkeeper will be permitted, and resulting goals allowed, when such contact is initiated outside of the goal crease, provided the attacking player has made a reasonable effort to avoid such contact. The rule will be enforced exclusively in accordance with the on-ice judgement of the Referee(s), and not by means of video replay or review. For purpose of this rule “contact”, whether incidental or otherwise, shall mean any contact that is made between or among a goalkeeper and attacking player(s), whether by means of a stick or any part of the body. Clear on goaltender interference yet? 69.2 Penalty – In all cases in which an attacking player initiates intentional or deliberate contact with a goalkeeper, whether or not the goalkeeper is inside or outside the goal crease, and whether or not a goal is scored, the attacking player will receive a penalty (minor or major, as the Referee deems appropriate). In all cases where the infraction being imposed is to the attacking player for hindering the goalkeeper’s ability to move freely in his goal crease, the penalty to be assessed is for goalkeeper interference. In exercising his judgement, the Referee should give more significant consideration to the degree and nature of the contact with the goalkeeper than to the exact location of the goalkeeper at the time of the contact. If a goalkeeper, in the act of establishing position within his goal crease, initiates contact with an attacking player who is in the goal crease, and this results in an impairment of the goalkeeper’s ability to defend his goal, and a goal is scored, the will be disallowed. For this purpose, a player “establishes a significant position within the crease” when, in the Referee’s judgement, his body, or a substantial portion thereof, is within the goal crease for more than an instantaneous period of time. 9.4 Contact Outside the Goal Crease – If an attacking player initiates any contact with a goalkeeper, other than incidental contact, while the goalkeeper is outside his goal crease, and a goal is scored, the goal will be disallowed.9.4 Contact Outside the Goal Crease – If an attacking player initiates any contact with a goalkeeper, other than incidental contact, while the goalkeeper is outside his goal crease, and a goal is scored, the goal will be disallowed. A goalkeeper is not “fair game” just because he is outside the goal crease. The appropriate penalty should be assessed in every case where an attacking player makes unnecessary contact with the goalkeeper. However, incidental contact will be permitted when the goalkeeper is in the act of playing the puck outside his goal crease provided the attacking player has made a reasonable effort to avoid such unnecessary contact. When a goalkeeper has played the puck outside of his crease and is then prevented from returning to his crease area due to the deliberate actions of an attacking player, such player may be penalized, if by his actions outside of his crease he deliberately interferes with an attacking player who is attempting to play the puck or an opponent. 69.6 Rebounds and Loose Pucks – In a rebound situation, or where a goalkeeper and attacking player(s) are simultaneously attempting to play a loose puck, whether inside or outside the crease, incidental contact with the goalkeeper will be permitted, and any goal that is scored as a result thereof will be allowed. In the event that the puck is under a player in or around the crease area (deliberately or otherwise), a goal cannot be scored by pushing this player together with the puck into the goal. If applicable, the appropriate penalties will be assessed, including a penalty shot if deemed to be covered in the crease deliberately (see Rule 63). 69.7 Fines and Suspensions – An attacking player who, in the judgement of the Referee, initiates contact with the goalkeeper, whether inside or outside the crease, in a fashion that would otherwise warrant a penalty, will be assessed an appropriate penalty (minor or major and/or game misconduct) and will be subject to additional sanctions as appropriate pursuant to Rule 28 – Supplementary Discipline. Ok so now that we are all clear on the NHL’s rule, why so much inconsistency with this infraction? It’s not just the Oilers either, but they are the poster child for missed calls over the past few seasons. Frustrating for a team that does not score a lot of goals. Hopefully the NHL will wake up when it comes to improving the entertainment value of the game. Fans are getting tired of the same old, same old. It’s time for a new generation of players and teams to be respected, promoted and cherished. Chicago has won their Cups, so has Los Angeles and the Bruins of Boston and perhaps this year the upstart Vegas Golden Knights. How about a little love and respect for our Canadian teams? I’m at a loss for words. As a hockey fan, it truly is hard to watch this night in and night out. Does Gary Bettman care? Does Colin Campbell care? Does Stephen Walkom care? Does Jeremy Jacobs care? I know that a lot of hockey fans care. A lot of coaches care and Connor McDavid cares. The NHL has a number of issues to deal with, let’s add another one to the list shall we? Clarity and consistency on goaltender interference should be near the top of the list. One more thought. How many of Wayne Gretzky’s or Bobby Orr or Maurice Richard’s goals would have been called back due to goaltender interference in their day? On that note, Happy Birthday Mr. Gretzky. ← Why are the Edmonton Oilers Struggling in 2017-18?